Many of the self-contained garden annexes we feature on this site are for families who are looking to create a home in their garden for an elderly relative. The thing is, they are just as useful a space for younger relatives who are craving a home of their own but can’t get on the property ladder. This recent project by Executive Garden Rooms is a fine example of that second scenario. Executive Garden Rooms clients were looking to help their son gain some independence. They looked at buying a one bedroom flat, but the cheapest flats they were looking at were £180,000. Cleverly, they looked at the space in their garden and realised that could be utilised to create a one bedroom garden annexe. 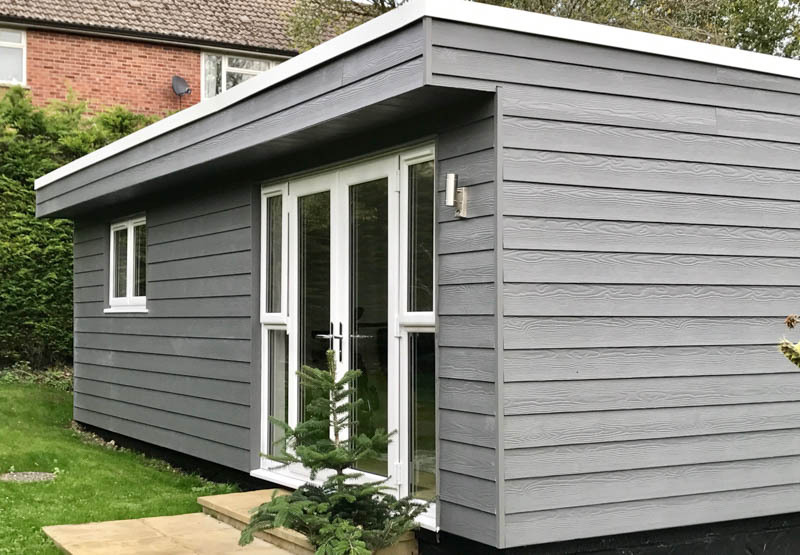 They approached Executive Garden Rooms and found that a modern self-contained annexe can be built for around £1,500 per square meter. Executive Garden Rooms offer a turnkey service, working with their clients from initial design and through the planning stage. They then handle the construction of the building including the associated groundworks until the building is complete. After an initial site visit and talking through the families ideas, the Executive Garden Rooms team drew up plans for an 8m x 5m garden annexe, comprising of the main living space with kitchenette, and a spacious double bedroom with ensuite shower room. 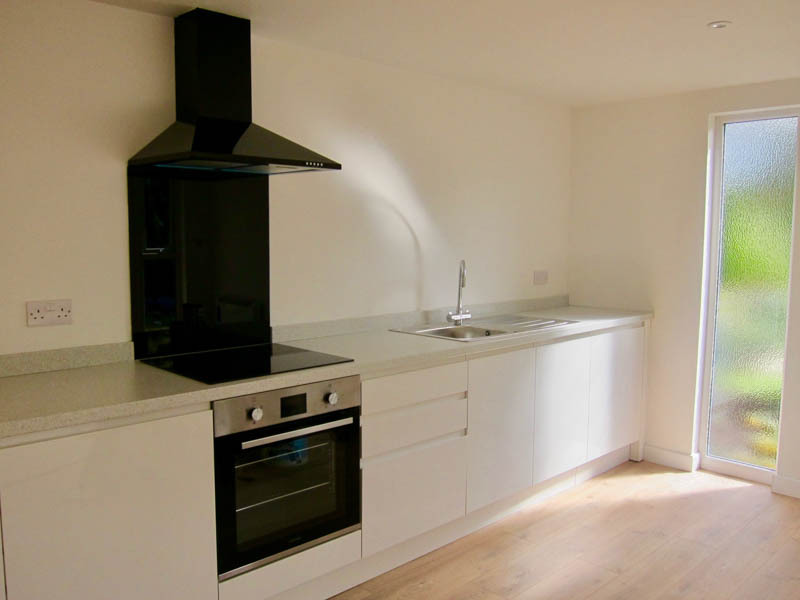 The project came in at £60,000, so a third of the cost of buying a flat. 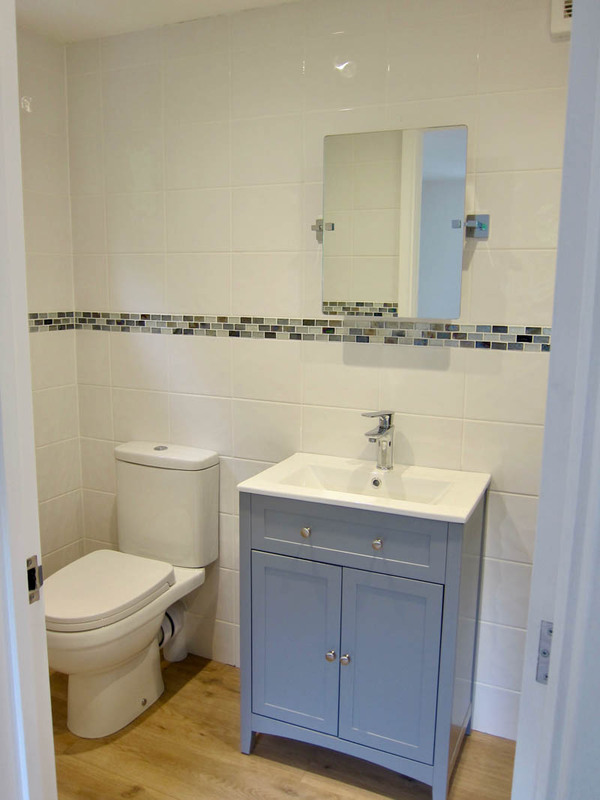 As this annexe will be inhabited by a relative under the age of 65, Council Tax will be payable. The annexe has been assessed and rated in Band A and has its own address ‘The Annexe’. The plot for the new annexe was 60 meters from the main house and the plot itself had a significant fall of the land. This meant that there were significant groundworks required. The Executive Garden Rooms team handled this as part of their turnkey project. The groundworks included excavating the site and preparing the shuttering for the foundation. At 8m x 5m this is a pretty big slab and the Executive Garden Rooms team reinforced it with steel rebar frames. The concrete for the slab was piped into the garden from a lorry. In addition to the slab foundation, a 60-meter trench was dug to channel the services to the annexe. 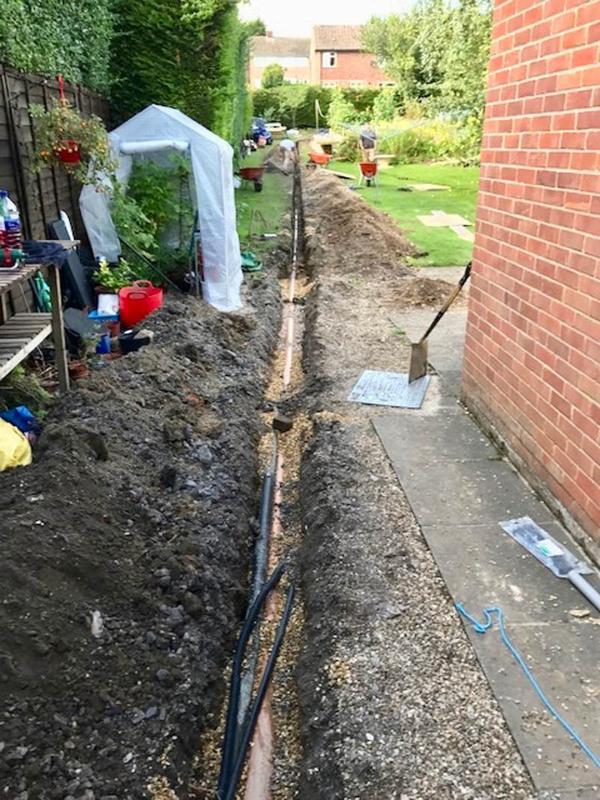 These included a pumping station, water supply, foul pipes, armoured cable for the electrics and CAT6 data cabling for the internet. All the groundworks were undertaken to building regulation standards. With extensive groundworks like this, you can be forgiven for thinking that your garden will never recover. Its interesting to now that the lawn had recovered within 8 weeks of the work. As you can see a modern home has been created. The annexe has been fully plastered and decorated and a Quickstep Livyn flooring laid. The combination of which has created a light and airy space. The main living area has a great connection with the garden, thanks to the mix of French doors with glazed side panels and a floor to ceiling window on the side elevation. We like how this has been positioned at the end of the run of kitchen units. The double bedroom that leads off the main living space has a casement window which will be easy to open when needed. The kitchenette features several storage cupboards, a single oven with induction hob and extractor hood, an integrated fridge and plumbing for washing machine. 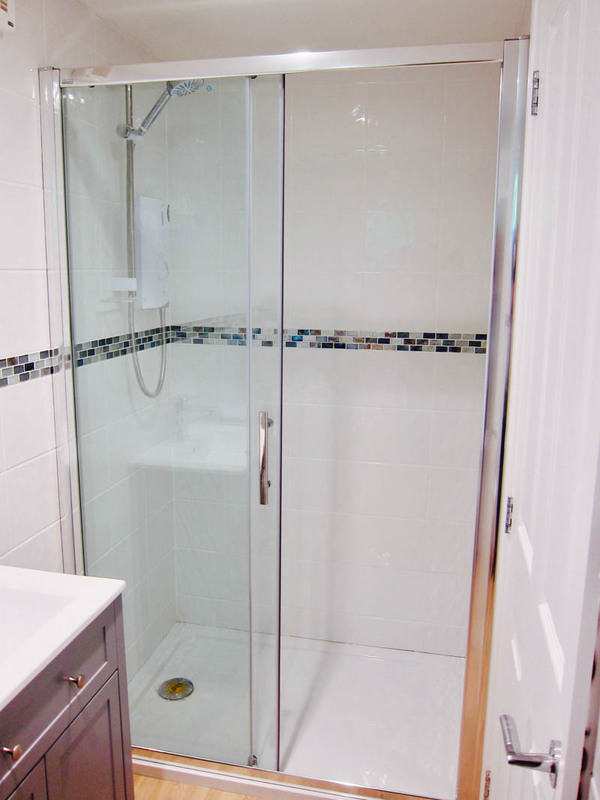 A tiled shower room leads off the bedroom. This has been fitted out with a Vanity unit, toilet, 10.8kw shower, a sliding shower door screen, low profile resin tray, extractor fan and heater. Executive Garden Rooms offer a well specified electrical package, tailored to their client’s needs. In this case, the package includes: CAT 6 data cabling for reliable internet, 2 smoke alarms, LED downlights recessed in the ceiling, external security lights and plentiful power points dotted around the annexe. When it comes to heating the annexe, you will see from the photos that slimline electric panel heaters have been fitted. This project clearly shows how an area of your garden can be utilised to create a modern home for a relative. Whilst still a significant investment, building an annexe like this can allow a younger relative to live independently, yet save for the day when they can afford to move up the next step in the housing ladder. To learn more about this project talk to the Executive Garden Rooms team on 01202 874 766 or send them an email. Explore www.executivegardenrooms.co.uk to see more of their work.